A luxury hotel like no other! An exquisite beach hotel sitting right on the beach, El Oceano redefines the term ‘luxury’! 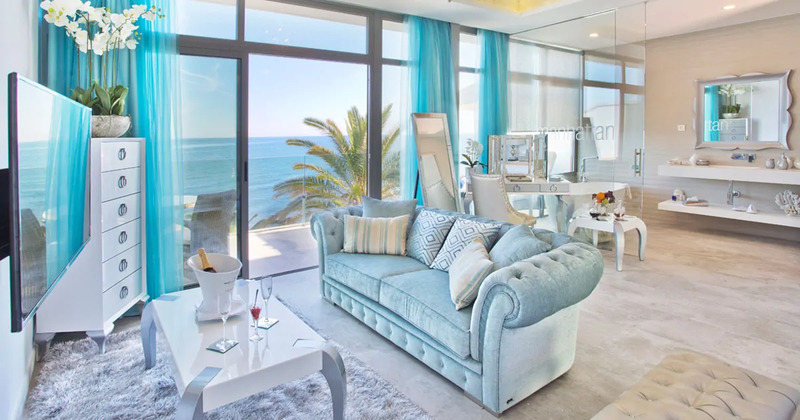 Elegant and charming accommodation with a outstanding restaurant and exclusive VIP sunbed terrace, El Oceano is paradise on the Costa del Sol in Spain. A luxury hotel so good, you won’t want to leave. 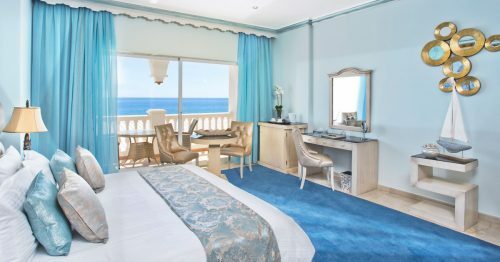 Right on the shore of the Mediterranean the Sea, our luxury beach hotel offers beautiful, unique accommodation in a relaxed, friendly and professional atmosphere. Each of our 50 rooms and suites are decorated and equipped to a very high standard. Tasteful and elegant, they reflect a subtle and understated luxury. 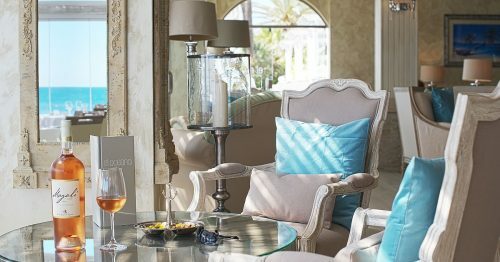 A unique luxury hotel on Spain’s Costa del Sol, family owned and operated, where attention to detail – and to the client – are paramount. We very much pride ourselves on the quality of our team and the service they offer. We’re also very visible! You are likely to see our owners and managers in the hotel or restaurant, most evenings. We like to be here, to meet our guests, to chat, to share a drink. 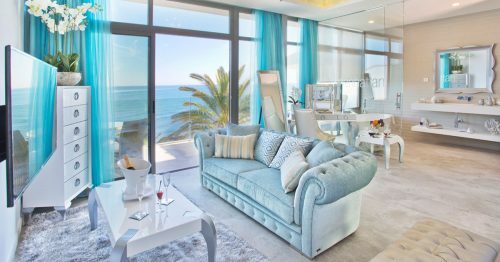 A distinctive contemporary style, the spectacular El Oceano Hotel offers opulent and spacious accommodation in a private and secure environment. What Makes a Luxury Hotel? El Oceano Hotel’s genuine beach location sets it apart from many other hotels. The unspoiled views from most rooms & suites, and from the restaurant are just stunning. The Mediterranean Sea opens up before you in a panoramic seascape and, on a clear day, it is possible to see the north African coastline and Pillars of Hercules at Straights of Gibraltar. If we were any closer to the sea, your feet would be wet! The hotel terrace is right on the sea shore, with the fabulous Mijas Boardwalk running directly in front. The Boardwalk gives access to the beach and, for those who may like a wander a little, access to La Cala de Mijas and the various small chiringuitos (beach bars). Courteous, polite, attentive and professional, we are very proud of our team. From Ignacio on the front door, Salva, Caroline and Jan on Hotel Reception, maître d’ Antonio and his team in the restaurant to Mike & Julie at the pool bar, our staff will make you feel special. It’s just in our nature! And talking of our team, we would like to thank the many hundreds of guests on Facebook and TripAdvisor who have made such kind comments about our team and the service we provide. All our rooms and suites are designed with the client in mind. El Oceano Luxury Beach Hotel is set within 10.000sqm of lush tropical gardens right on the water’s edge with a virtually private beach below! Heated swimming pool with ‘swim-up’ pool bar, beauty salon, beautiful bar and restaurant… plus the most amazing views of The Pillars of Hercules in North Africa, all from the comfort of the lush, well-tended semi-tropical gardens. The quality of our beautifully decorated and equipped rooms will take your breath away and all have free WiFi, climate control, satellite TV with many boasting spectacular Mediterranean views. The bar is a great place to relax and meet other guests. Right next to Reception, the bar is well stocked and our knowledgeable and well trained servers can recommend some of our fine wines, not to mention more ‘exotic’ cocktails and combinations. Each of our rooms and suites is decorated and equipped to a very high standard including Air-Conditioning, High Speed Fibre Wireless Internet Access, Satellite TV, King Size Beds, Bathrobe/Sleepers, Telephone, Mini Fridge, Tea and Coffee Facilities, Safe Deposit Box, Luxurious Bathrooms, Hair Dryer, Toiletries and Room Service. You’ll be impressed by El Oceano Restaurant, we’re sure of that. The 2016 redesign is even better than we had planned. A truly stunning restaurant, an impeccable menu and a fantastic dining entertainment lineup all sum up to the finest restaurant on the Costa del Sol. Right by the ocean, close to perfection. Whichever you choose, we’re sure your meal will be unforgettable. A five-star menu served by the most professional and courteous servers all the in the finest restaurant on the Costa del Sol. Almost every evening is accompanied by one of our fantastic regular entertainers and occasionally, special guests from all over Europe. Find El Oceano Hotel right on the sea-front between Marbella and La Cala de Mijas, on Spain’s beautiful Mijas Costa. Getting here is easy, we are just a 30 minutes drive from Málaga Airport. One of the more charming parts of the Costa del Sol, Mijas Costa offers cleaner beaches and avoiding the often-maddening crowds of other parts of this coastline. The newly constructed boardwalk, running right along Mijas Costa, gives to the opportunity to explore this wonderful coastline on foot. We are just a 10 minutes walk to the charming little town of La Cala de Mijas.